Can I Transfer AP Course Credits to my Online College? The College Board’s Advanced Placement program makes it easy to save money on a college degree, which is why so many online students wonder whether transferring AP course credits to online college is possible. The good news for these online learners is that the vast majority of online schools do accept sufficient AP scores as a way to waive general education courses that a student has already mastered during their time in high school. As with every college’s unique policies and requirements, however, students in an online degree program will need to make sure that their courses, AP exam scores, and other information matches up with the school’s expectations. If it does, AP classes will help students graduate more quickly and with far less student loan debt at the conclusion of the degree program. Most schools will publish whether or not they accept AP scores on their undergraduate admissions website, alongside information about SAT scores and school submission codes. If the information can’t be found on the school’s website, students can visit the College Board’s website to research whether or not their school participates in the AP credit program. Using the College Board’s “Big Future” search tool for colleges and universities, students can enter the name of each school that they wish to attend. Online schools are included in this database right alongside their offline counterparts. Upon finding each school in the Big Future database, students simply click on that school and then choose the “Applying” tab. Within this tab, a full list of accepted courses and AP exam score requirements will be listed. 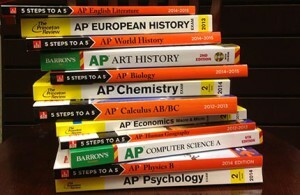 Simply taking an AP course in high school does not guarantee that students will be able to waive the corresponding course at an online college or university. In fact, the opposite is true. Students will have to prove that they have learned enough of the material to qualify for a credit waiver at each institution. This process is done by verifying the student’s score on the final AP exam required at the end of each AP class. This exam, typically taken over the course of two to three hours, serves as a cumulative final that covers all of the class’ topics. At the end of the exam, the instructor will submit the results to the College Board for grading. When the grading process is finished, typically within a few days or within a few weeks, students will receive an official grade report. This report will give the student a grade of 1, 2, 3, 4, or 5: The higher the number, the better the score. Most colleges have set a minimum required score of 3 in order to waive a course for AP students. Some schools, however, are a bit more demanding. These institutions may require that students score a 4 or even a 5 on their AP exam in order to waive the corresponding college course. An AP class is only a great value if students can score high enough to waive the corresponding college course associated with that AP class. For this reason, students should study hard, put in a great deal of effort, and make sure that their grades and their final AP test score meet their school’s minimum requirement. If they do, they will find that transferring AP course credits to online college degree programs is as easy as it is valuable. See also: Can I Enroll in Online College While Still Completing High School?